There are a few instances in life where you’ll need to take your dog on the road. Whether it’s to take them on a long walk through the country, or to move them to your new home, it’s important to first consider the problems which might occur. With that in mind, here are a few tips to make your long-distance trips all the more bearable. A dog which is worn out will be more inclined to rest – which is precisely the condition you want your dog to be in during a long car trip.Conversely, a dog which hasn’t been properly exercised will be restless and full of energy. This will create stress for them during the drive, creating a distraction for you. In order to ensure that your dog is relaxed, it’s often wise to take them on a long walk before a car journey.This way they won’t have the strength to put up much resistance when you put them into the back of the car.Some people like to put their dog to sleep using a sedative, but this can have a number of unpleasant and unpredictable side effects, and build up a drug dependency, and so most veterinarians advise against it.In most cases, it’s far preferable to wear your dog out in the natural way! 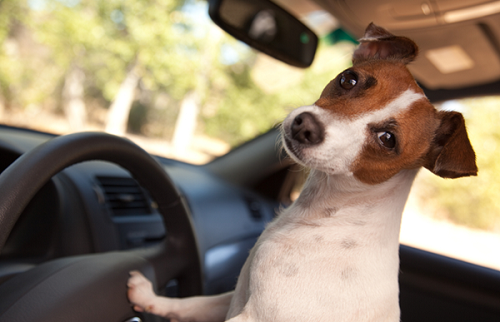 It’s important to keep an eye on your dog’s temperature while transporting it.This is especially so in hot, sunny weather, since the temperature within a car under direct sunlight can rapidly climb to twice that outside it.In normal circumstances, dogs can deal with excess heat by seeking shade – but in a car, there is nowhere to go. It’s therefore hugely important to monitor a dog’s condition for signs of heat stroke and to provide them with a pleasant, cool breeze by opening a window. If you’re concerned that they might take advantage of this gesture and make an ill-advised escape attempt, then you can buy a special grille to fit over the open window. For more than thirty years it’s been illegal for humans to travel by car in the UK without wearing a seat belt.But cars were not designed with dogs in mind and so such laws do not affect them. Nevertheless, it’s important to take similar precautions with dogs in order both to lessen the impact of a collision and to prevent the dog from moving around during transport.Smaller dogs can be easily housed in dog baskets, which can be stored on car seats, while larger ones can be stored in the rear of a hatchback or estate using larger dog cages, or enclosures which fit across the gap between the rear seats and boot. A cage will prevent a dog from moving around during transport and thereby injuring itself. It will also prevent the dog from causing a distraction to the vehicle’s driver and passengers. If you want the safest solution, a cage is therefore advisable. It’s easy to sympathise with caged dogs – after all, we humans would not wish to be put into a cage against our will.But this sympathy is often misplaced; a dog can quite happily sit in a cage for hours on end, provided that they’re adequately exhausted. Just be sure to stop every few hours along the way to let the dog stretch its legs. As much as it’s important to protect your dog during transport, it’s also important to protect your car from your dog. This is especially so if you’re taking your dog out for a long walk in the woods, which will inevitably result in muddy paws.It’s therefore wise to invest in protection in the form of a car boot liner. A car boot liner is a sheet of fabric which sits within your boot, protecting it from whatever items you might put in there – whether they be muddy boots, muddy jackets or muddy dogs.When the time comes to clean the boot, you can then simply remove the boot liner and toss it in with the rest of your washing.This solution is therefore far preferable to having to clean the interior of your car – a stressful and time consuming chore. Boot protectors are available in a number of varieties, but the best are those which are made to measure.Audi, Mercedes and BMW boot liners are available in sizes which fit a range of different models.Owners of such vehicles would be advised to invest in these more substantial boot liners, as the savings made in cleaning costs (and in protecting the car’s resale value) will likely prove worthwhile in the end.